On Thursday night we had our farewell dinner with Brett and Caitlin at De Big Fish in Prickly Bay (see the google map). It's a casual restaurant, open air and right on the water. Brett was talking about how he was disappointed to be missing Fish Friday, the big event up the island the next evening. It sounded great but they were going to be on a plane back to Vancouver and we were planning on moving to a new anchorage and didn't feel like adding a cross island trek to our day (and we'd be here for a few more Fridays so we were sure we'd get there one of these weeks). However, 24 hours later we were all there enjoying the food, sounds and atmosphere of the little town of Gouyave. The town of Gouyave on the North West coast of Grenada hosts a street party every Friday called Fish Friday. Three tiny streets (they are all tiny around here) are blocked off, tents are pitched, the BBQ's come out and young guys start rolling large speakers out of their homes and running thick speaker cable down the roads. After dark, a little after 6pm, the music starts and the food comes out. By 9 it's shoulder to shoulder in places with about 50% of the people local islanders and the rest tourists (there was only a smaller cruise ship in port down island so maybe it's different when the big ones are there). There are all kinds of fish and side dishes with nearly everything deep fried, pan fried or BBQ'ed. And there are lots of drink tents serving very strong rum, sometimes lightly disguised in a fruity punch. But how did we all end up here? Simple, they missed their flight. Brett's phone changed timezones on him overnight setting him back an hour. Despite a mad rush to get to the airport and arriving 45 minutes before their departure time, the check-in gates were closed and they were not permitted to board. Shucks. Another day in Grenada. Fish Friday was back on the menu! We called up our friendly cab driver Toney (very reasonable rates, very friendly and a nice clean, air conditioned van) and made arrangements to be picked up around 5pm. The drive up the island was quite pleasant. The traffic was light, the sun was setting on the western horizon and people were liming on the side of the road celebrating the arrival of the weekend. There was still enough light that we could see many of the colourful, haphazard homes, lining the road and hillsides. In places the road is practically in the ocean with only a stone sea wall keeping the water and sand out. In others it winds precariously up steep volcanic slopes covered in banana, palm, lemon and guava trees. Most of the food vendors were already in place and the drink vendors were just setting up when we arrived. The music started not long after that. We sampled many different fishy treats from all the vendors. The most visually spectacular were the deep fried whole fish - head, tails and all. The guts had been cleaned out but you ate everything else. They were about 4 - 6 inches long and tasted a bit like sardines or fresh anchovies (not the canned variety). The fish cakes were yummy, the kabobs full of fleshy fish and the lobsters looked glorious garnished with grated and chopped fruit and vegetables. Our favourite drink of the night was Ting, a carbonated grapefruit soft drink. The kids loved it plain and the adults were enjoying it mixed with rum. A close second was Sorrel, a Trinidadian drink frequently made at Christmas. The heavy clove flavour reminded us of mulled wine. 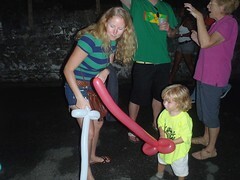 A Rasta was selling balloon animals for next to nothing so the kids got a bunch then had swords made. A great sword battle ensued with some encouragement from a few of the adults and even some of the spectators!